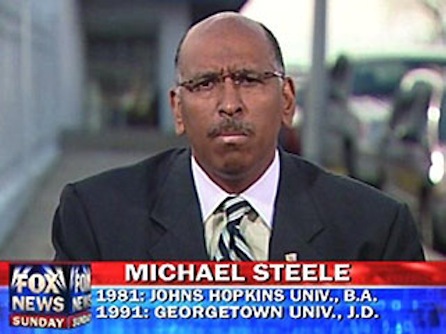 It'll be the end of days for Michael Steele on Fox News. MSNBC veered a bit off its latter day track Monday by announcing the hiring of former Republican National Committee chairman Michael Steele as a full-time political analyst. "His strong voice and opinions will be a great addition to all of our programs," MSNBC president Phil Griffin said in a publicity release. Steele's largely conservative views will clash with the network's contingent of liberal news analysis programs, which have multiplied in recent years as a counterpart to Fox News Channel's conservative agenda. Steele said he's looking forward to "engaging a diverse audience to share insights and analysis about the people, issues and events shaping America's future." Steele apparently will make regular in-house appearances on left-of-center programs anchored by Chris Matthews, Rachel Maddow, Lawrence O'Donnell and Ed Schultz. ***Showime has renewed Edie Falco's Nurse Jackie series for a fourth season, but won't be bringing back the multiple personalities of Toni Collette in The United States of Tara, which is currently in its third and now final season following Jackie on Mondays at 9:30 p.m. (central).